Today, (Sunday) is to be our last one here at Calp, and even though Estrella (the site) leaves a little to be desired, we've quite enjoyed our stay - although we both feel more than ready to move on now! 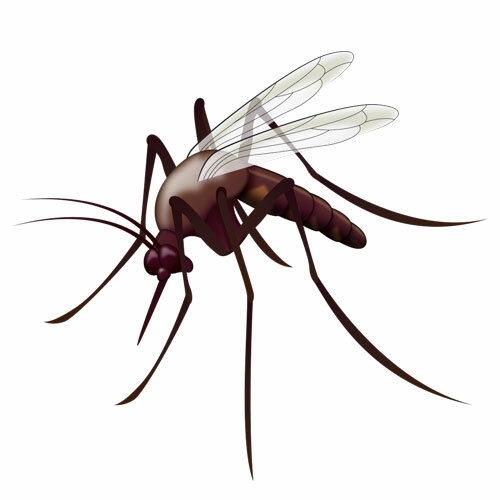 I think that's probably being contributed to by several factors which include the miserable mozzies (I managed 17 bites in one day! ); the lack of new things to do (we've got big hills with busy roads behind us and the sea in front so our choice for outings is limited to either turning left of right); and the weather which has taken a decided turn for the worse and has provided rain and wind with a bit of thunder thrown in for good measure over the last 24 hours! It was almost impossible to sleep last night with what sounded like someone banging on a drum just above my head, the local dogs howling and my beloved partner tossing, turning and occasionally snorting in his quest for slumber! And I suppose all of the above sounds like I'm moaning - but when I compare what we're enjoying now to what we might be enduring if we lived a 'normal' life in a house back in cold old Blighty it makes us count our blessings. Off course we miss our family and friends very much, but we're not missing anything else - storms, snow, work, bills and the mundane sameness that every winter day would be likely to bring - that certainly doesn't float our boat! Here we're mostly basking in Spain's winter sunshine (16 - 20 degrees most days), we're enjoying the company of new friends and experiences, and we've got the freedom to move about as we please to find new areas to explore! So what have we been up to for the last few days? Well, on Tuesday we I was still recovering from our climb up the Rock - Ifach - achy arms and legs from scrambling in an unladylike fashion up and over so many boulders! Therefore we were quite happy to settle for another very gentle day with only a walk along the coastal path towards Benissa along with a picnic lunch overlooking the sea. And when that was done we returned home to sit be the van with our Kindles - but I think that was when the Mozzies feasted on me ! On Wednesday we released our bikes from their week long captivity in the garage and cycled 10 miles up the coast to Altea for a reunion with Bob, Amanda, Jack and Liz (friends we'd made at Monmar), and once hugs and hellos had been indulged in we spent several hours enjoying their company and a very leisurely 3 course menu del dia lunch which included pork in Gorgonzola cream sauce and monk fish with mussels! 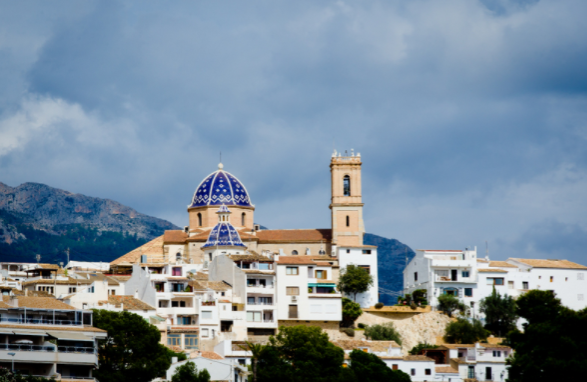 As we'd approached Altea a beacon that had stood out high up on the hill was the beautiful blue and white tiled church dome peeking out from amongst glistening white houses that are part of Altea's old town, and later we got a close up view of it after meandering our way up through the quaint and typically Mediterranean streets to the town square. Here we enjoyed a 2nd coffee break (or maybe that was beer) as we sat in the church square and listened to a very good busker playing typical Spanish music! 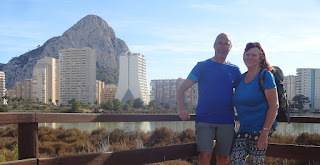 It was all very lovely and tranquil, and quite hard to believe that the cacophony of Benidorm is only a very few miles up the road! Thursday turned out to be another coastal walk but with the addition of an excursion a short distance inland to visit Las Salinas - a landlocked saline lake where a majestic colony of flamingos make their home. The large lagoon has various wooden walkways from where close up access to the birds is possible, but the rest of the park is a bit rough and wild, and really we both thought much more could be done to make the area more of a tourist attraction. Later, we filled our afternoon with more effort filled relaxing by the van - this time with lots of insect repellent on - but the little buggers still managed to find a spot on my finger that I'd missed! And on Friday we treated ourselves to a 3 course fish lunch at a sea front restaurant called Zaphiro all for the princely sum of 31 euros which included a bottle of very acceptable vino tinto! However, John was a bit tempted to complain because he found something floating in his soup! Apparently there were lots of other crunchy, slimy and slippery bits as well (squid and 🐙) - but he said it was very tasty! Saturday saw us taking ourselves off for yet another coastal walk - but even though we'd followed the same path several times it was still very enjoyable! What is there to complain about - a lovely place to walk with fantastic views, great company, tasty chicken baguettes and crisps to scoff and lovely warm sunshine while we sat and discussed our forthcoming year of travels! But then came the rain - huge torrents of it slamming into T4rdis2 from about 6pm on Saturday until 9ish on Sunday - and more has been promised for later in the day! So for today our big decision is should we have a proper Sunday day off, or should we risk a drenching and nip out for another walk that might include coffee and cake! I think the former is likely win because Sunday Brunch (cooked by yours truly) is calling and we've got loads of planning for our forthcoming (May) Scandinavian adventure to do! Either way our day is going to be rounded off with an outing to the Nepali Base Camp! A very near by Indian Restaurant that has excellent Google reviews and a place that we're fairly sure will feed us well!